Former AdMob Founder Omar Hamoui’s Churn Labs, his first venture after selling his mobile ad company to Google (s GOOG) for $750 million, was one of the early highlights for TechCrunch Disrupt’s Start-up Battlefield. Hamoui’s first creation is Gnonstop Gnomes, an intriguing mobile app that allows users to transfer a digital gnome between devices and chart the character’s movements around the world. It’s a curious first step for Hamoui, who created Churn Labs in Irvine, Calif. earlier this year as a way to test out ideas in overlooked areas. In this case, it lets Hamoui explore the notion of whether people will find some value in sharing a unique digital character between friends. But the really intriguing thing is the technology built into the app, which allows people to transfer one gnome between devices. Users can view a gnome on another device using their view finder on the app and when they line up the gnome to an outline, it is “lifted” to the second device. Hamoui also showed how devices can share pictures using the same technology. 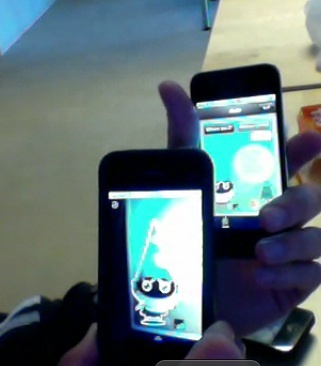 Using a view finder, a person can drag a picture from one app onto the image of the second device, which receives it. Pretty cool stuff. Hamoui said Churn Labs wasn’t necessarily designed to make a lot of money. But it’s built to explore these interesting ideas and see where they can go. “For all of us, this is what we want to do. Whether it’s something ridiculous or silly or something more serious; this is what we enjoy doing,” he said. Weotta is throwing its hat into the local recommendation market. It builds an entire itinerary for the night based on your personal interests and simple information you feed into the website. If you enter in plans for a date with a classy vibe, Weotta will take what it knows about you and create possible itineraries like a dinner, movie and drinks afterward. It’s not curated information but all derived from smart algorithms. Once you create an itinerary, you can quickly create a Facebook event and invite others. The service will link to outside reservation and ticketing services such as Open Table (s open) and Tickermaster (s lyv). 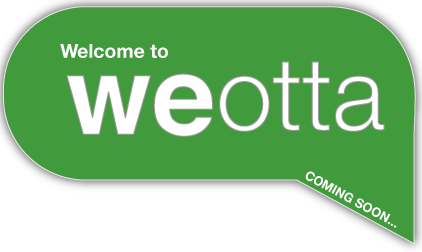 The events can be shaped by what Weotta knows about you from your Facebook profile. And itineraries can be altered using real-time recommendations from friends. Weotta will have to provide some good recommendations right off the bat, things people might not have thought about themselves. And it will need to be really tailored to people to create some personal plans for them. Weotta said it will also allow you to collaborate with fellow users on an itinerary so the plans reflect the interests of multiple people. This is a busy space but I like the idea of pulling it all together in one service. Sonar is looking to help uncover the hidden connections between people at venues. The idea is that it will help you find people to interact with that you’re already connected with in some way. It’s a cool idea, bringing your online social graph into live venues so you can figure out interesting people to chat up. 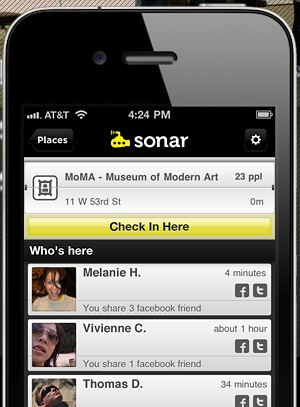 When a user arrives at a place, you can announce your presence with Sonar and the app will tell you who is also there that you’re connected to. So if you have someone there that shares a Facebook, Foursquare or Twitter friend, you’ll be able to see them. You can also look up a quick bio to see if the person is someone you might want to meet. If you do, you can send out a preformed invitation to chat citing the person you have in common. Sonar said it only uses publicly available data so users must make that private if they don’t want that to be used. But I think this is a cool way to discover people around you that you might not have realized were there. Rexly is stepping in where Apple (s aapl) has failed with Ping. It’s a media recommendation engine that tries to make smart use of user behavior data and social information to push out good suggestions on what to buy. The service, which works with iTunes music to start, builds an activity stream based on every action a user does in iTunes and allows users to share and comment on content. Then it creates recommendations based on your actions and those of your friends. But it does it in an intelligent way, allowing a user to identify up to six trusted people to follow, whose tastes will have more sway in a user’s recommendations. While this only works with iTunes music for now, it’s meant to scale up and be a service that recommends movies, TV and books from Netflix, (s nflx) Amazon (s amzn) and other services. And that will make it even more appealing as a cross-platform recommendation platform that touches various forms of media. I think Apple’s meager attempt with Ping shows there’s more work to be done in this space. That’s why I like Rexly. It has a way to be smart about social signals, applying more weight to trusted friends and it has a cross-platform play that other single providers won’t or can’t implement.